“Early on the morning of our first full day in Costa Rica, we got up to go birding with Alex Martinez, our host in Puerto Viejo de Sarapiqui. As we were walking through a pasture not far from his B & B, Alex pointed out two pair of large green Macaws, flying in formation overhead. 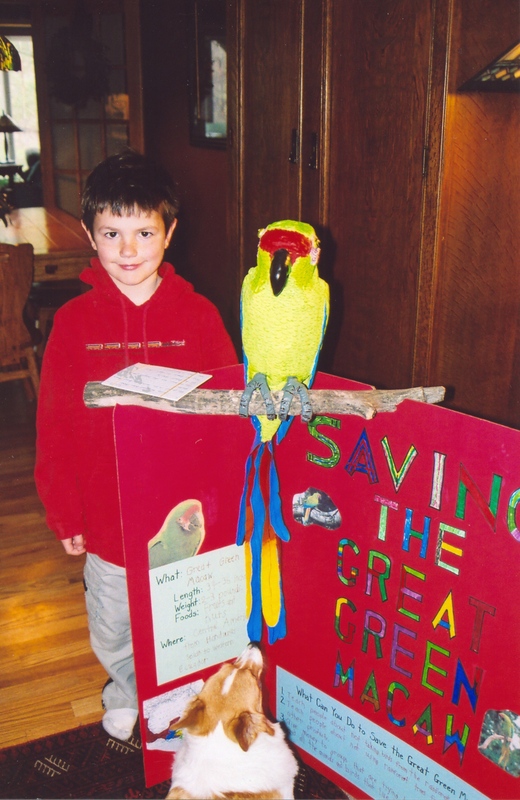 He told us “You are looking at ten percent of the nesting population of Great Green Macaws in Costa Rica.” At about the same time, a small green feather floated down from one of the birds, which Alex picked up and gave to our seven year-old son, Kyle. Later that evening, after dinner, Alex spoke with us about the efforts of the conservation community to restore and protect the Great Green Macaws (“Lapa Verde” as they are known in Costa Rica) and their habitat in northern Costa Rica and Nicaragua. Throughout the rest of our trip, we saw many new and amazing birds and other wildlife, but nothing impressed us quite as much as the sighting of those four beautiful Macaws.